There's a right way and a wrong way to prune a cedar shrub. The problem is, cedar shrubs grow their green leaves only on the ends of their branches, generally not more than 5 or 6 inches in from the tip of the branch. Any closer to the trunk and you will be exposing dead leaves and branches that may never fill in again, leaving your shrub permanently scarred. 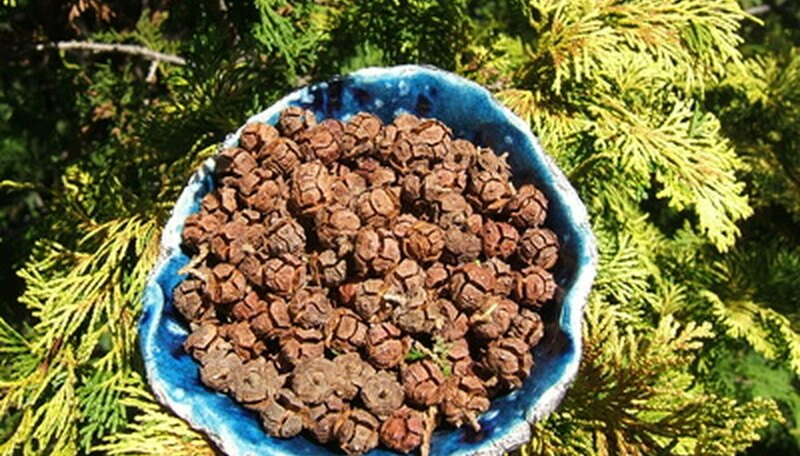 For best results, your cedar shrub should be pruned in late winter or early spring, before new growth appears. Separate a few branches carefully to allow access to the center portion of the shrub. Remove any interior branches that are totally dead. Determine if branches are dead by gently bending the tip of the branch--if it bends, it may still be alive, but if the tip snaps off, the branch is dead and can be removed all the way back to the trunk. In most cases, dead branches can be snapped off with gloved fingers rather than shears. Clean out as much of the center of the bush as possible without removing any living branches. Use your pruning shears to cut off the tips of branches that are not conforming to the overall desired shape. Be extremely careful not to cut off more than 3 to 4 inches of any branch, and never cut back to brown wood or brown leaves because the plant may never grow new leaves to fill in the brown spot you have revealed. Cut the tip of the main trunk if you wish to reduce the height of the tree or wish the tree to grow slightly more full and shrub-like. Never cut off more than one-fourth of the shrub's height in any one year. Cut branches that are growing sideways through the canopy of the shrub, so long as doing so will not create an opening to dead, brown growth visible from the outside of the shrub, as this may never fill in properly. Do not expect your cedar shrub to look its best right after pruning. It takes time for green leaves to fill in the cut areas. If in doubt, don't trim.